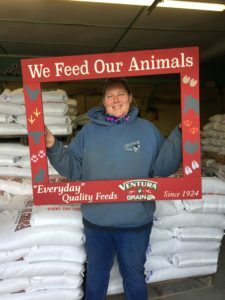 Poultry – Ventura Grain Co. Inc.
With over 90 years of experience manufacturing livestock, equine, poultry and swine feeds, Ventura Grain has the expertise and integrity to ensure a consistent, fresh & quality ration every time. Our ingredients are purchased from a select group of approved suppliers to ensure the quality of our feeds. Ingredients are tested for quality and if they do not meet our standards, the load is rejected. All of our bagged feeds can be purchased in our retail store. Located in front of the mill, our retail store carries a great selection of supplies for farm, barn, stable & house! Ask about quantity discounts on our manufactured feeds. This mash feed is formulated with added amino acids, minerals and vitamins and contains Amprolium, a coccidiostat that prevents cocci bacteria. We recommend feeding this grain to layer birds for 1-8 weeks and to meat birds for 10-12 days. Chick Grower/Finisher provides the nutrition needed for the chicks growing stages. It is easy to digest and consume in a crumble form. It contains a balanced amino acid profile to support the dynamic turn-over and growth of structural (bones, ligaments, and muscles) and protective (skin and feathers) tissues in the bird. This ration should be fed at week 8 until the first egg is laid and then a complete layer feed should be given to support optimal egg development. To be fed throughout the laying period once the first egg is laid (16 -20 weeks). Our layer ration is designed for high production and egg quality. Grit and oyster shells may be added periodically if desired. A high energy feed for growing and finishing broilers. Feed continuously as the sole ration from approximately 10-12 days to market (42-52 days). A ration for pheasants, quail, waterfowl, peacocks and poultry* (*during times of stress or molt). A fish meal based protein feed that is offered in a crumble or pellet to be fed to game birds from hatching to adulthood. A feed which can be fed to all ages of pigeons with or without hard grains. 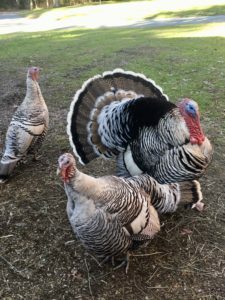 A feed designed for starting turkeys from day 1 to 8 weeks of age with Monensin which is a coccidiostat that aids in the prevention of coccidiosis in young turkeys. Amino acids are added for improving growth. Feed from 8 weeks of age to 3 weeks before slaughter. Amino acids are added for improved performance. Should be fed for 3 weeks before slaughter. Finisher helps to put a cover of fat on the bird and increase flavor and tenderness. Growing Emus: Feed free choice from 2 months to breeding age. Maintenance: Feed at least 4x/day the amount the bird will clean up in approximately 30 minutes, depending on bird’s condition. Hay or Alfalfa Pellets can make up around 1⁄2 the diet. Whole kernels of corn that have been mechanically cracked. 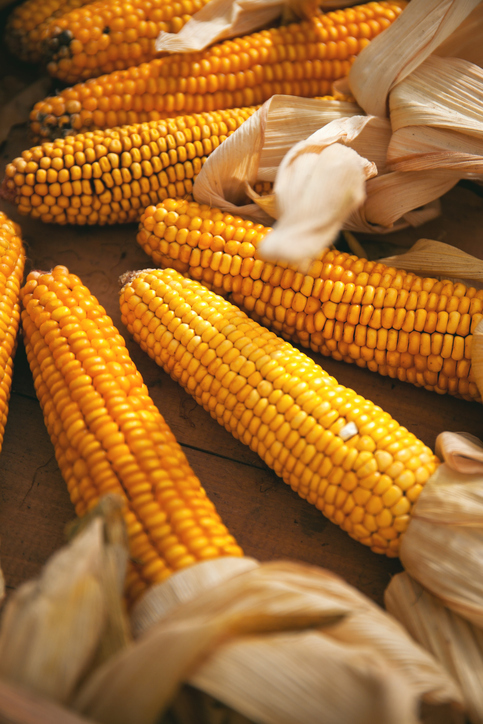 Improved digestibility versus whole corn (not recommended for horses). Adding corn to a ration increases energy level. 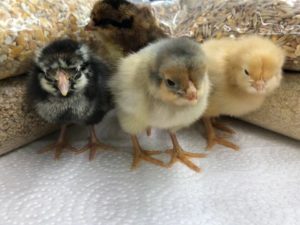 Starting in March, we offer many varieties of laying hen chicks, bantam chicks, ducklings, guinea keets, turkeys poults, and fast-growing white broiler chicks. We will have a calendar of delivery dates available for in the retail store and on our website in February. Please call the store for large or special orders. 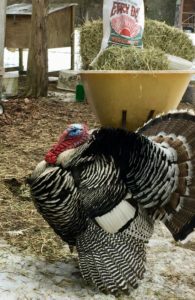 **Please note, ducklings, guinea keets, turkey poults, and broiler chicks will need to be ordered in advance, during the ordering window in April. 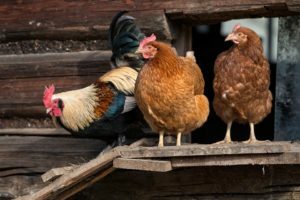 We always have all your poultry supplies in stock; waterers, feeders, incubators, heat lamps, bulbs, thermometers, electrolytes & probiotics, egg cartons, nesting boxes, dust baths, flock blocks, mealworms & cakes, treats…..everything you need to raise healthy poultry! Goslings – 2nd Shipment is arriving May 3rd. Ask about quantity discounts on our manufactured feeds!